CHATTOGRAM: A loop of ‘Akhtaruzzaman Flyover’ was opened for traffic to ease traffic congestion ahead of the Eid-Ul-Fitr’ in the city on Friday afternoon. Chattogram Development Authority (CDA) Chairman Abdus Salam inaugurated the loop at Sholoshahar Gate No-2 intersection in the city. Addressing the programme, CDA Chairman Salam said the traffic congestion at the Gate No-2 will be reduced to a great extent after opening the loop. He said hundreds of vehicles from the heavy industrial area in Bayezid Bostami had to get stuck for hours due to traffic gridlock causing immense sufferings to the commuters. The CDA chairman said another loop of the flyover will be opened for the traffic before the Eid-Ul-Fitr. 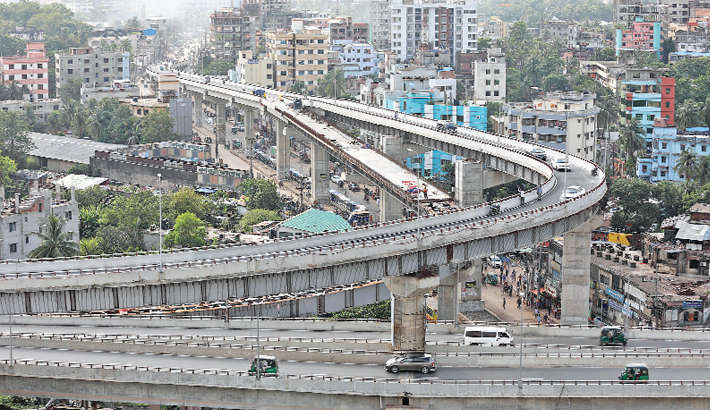 Terming the opened loop as Eid gift from Prime Minister Sheikh Hasina for the city dwellers he said that traffic jam through the main thoroughfares of the city will be reduced remarkably following its opening. Putting up development activities of the government, he said Prime Minister Sheikh Hasina led government is needed for continuation of the country’s advancement further. CDA Board Member Jasim Uddin, KBM Shahjahan, Ward Councillor Morshed Alam, Shulokbahar Ward Awami League (AL) President Atikur Rahman and Mohora Ward AL leader SM Anwar Mirza were present at the programme among others. Mentionable, the flyover from the city’s Muradpur to Lalkhan Bazar areas was opened for traffic to ease congestion ahead of the Eid-Ul-Fitr on June 16 last year. Construction works of the project started from CDA Avenue in front of N Mohammad Plastic Company at Muradpur immediate after the project site was handed over to the contractor - Max-Ranken (JV), a local and Chinese joint venture company, on February 22 in 2015. After starting construction some changes were brought in design to make the flyover more effective. Construction of the two-storey loop at Sholoshahar Gate No.2 intersection and ramps - entry and exit points’ in GEC area were included in the project. Inclusion of the loop and ramps increased the length of the flyover to 6.8 Km from the previous 5.2 Km and the project cost stood at Tk 6.980 billion from Tk 4.623 billion. The 70-feet high loop at Sholoshahar intersection was landed near Baby Super market providing exit and entry facilities for vehicles to and from Lalkhan Bazar end.